Justin TV for iPhone for free from Leo Laporte. VLC Media Player for iPad for free from Leo Laporte. Ki Pro Mini at http://www.aja.com for $2000 Ã?â? ?Ã?Â from Alex Lindsay. Dragon Dictate 2.0 for $199 from Alex Lindsay. 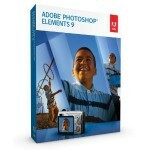 Adobe Photoshop Elements 9 (Win/Mac) for $99 from Andy Ihnatko. Adobe Photoshop & Premiere Elements 9 (Win/Mac) (combo) for $149 from Andy Ihnatko.